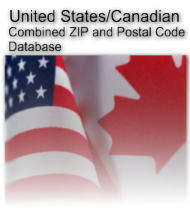 Basic United States 5-digit ZIP and Canadian Postal Code data. This product contains all United States ZIP codes and Canadian postal codes in a single package. It is the perfect choice when all you need is city, state or province to postal code cross reference. Province CHAR(2) Official abbreviation of the state or province.